Thinking of giving someone diamonds this holiday? Most people think the De Beers company coined the famous tag line - Diamonds are Forever, but the Medici family were the first to use this slogan. In case you have missed the endless posts on my favorite corrupt family in history, the Medici were a powerful Italian banking family with an eye for art and a talent for money lending. They started breeding little financial wizards in the 13th century, and were ruling like gang busters by the 16th century. Through wars, scandals and assassinations, the Medici proved again and again that they had the survival instincts of plague fleas. So it was only fitting for them to adopt the durable diamond ring (shown above) as their family emblem accompanied by the Latin word, "semper" (always). They might not have been as sparkly, but the Medici, like diamonds...were forever. 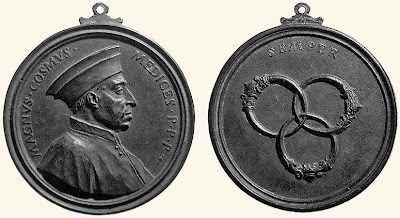 The Medici family emblem can also be found in Claude Paradin's emblem book from the 16th century. (More on emblem books in a future post.) 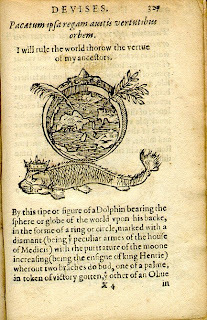 We can see the Medici diamond riding a heraldic dolphin.1 The dolphin is described as "king Dolphin" and represents the Dauphin, Francis II. A palm branch symbolizing victory and an olive branch symbolizing peace sprout out from the diamond. The image signified the enduring power of the diamond ring (Medici blood) combined with the royal blood of the "dolphin" (Dauphin, Francis II). The image was a blantant public relations message for the French Crown— Francis backed by mama Medici (aka Catherine) would be a strong reign. Claude Paradin's Emblem book courtesy of Penn State University. Stemp, Richard. The Secret Language of the Renaissance: Decoding the Hidden Symbolism of Italian Art. New York: NY, Sterling Publishing Company, Inc., 2006 . Van Veen, Henk th. Cosimo I de' Medici and his Self-Representation in Florentine Art and Culture, Cambridge University Press, 2006.